Lucy and Maria Aylmer, 18, from Gloucester are non-identical twins - while Lucy has fair skin and straight ginger hair, Maria has a darker complexion with curls. The college students, were born with radically different colouring thanks to a quirk of their mixed-race parentage. 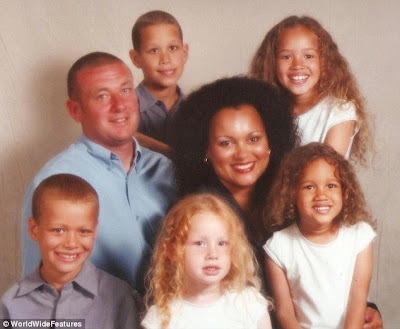 Their mother Donna is half Jamaican and their father Vince is white. 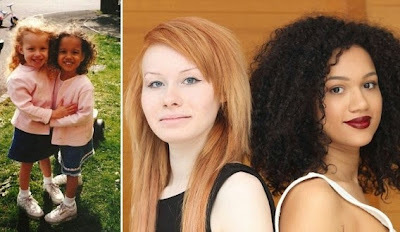 Their mother was astonished when she first saw the twins, as nothing on the scans had prepared her for their different skin tones.Their mother, who is 47 and a warehouse worker, and their 53-year-old father, who works as a scaffolder, split up after the twins were born. 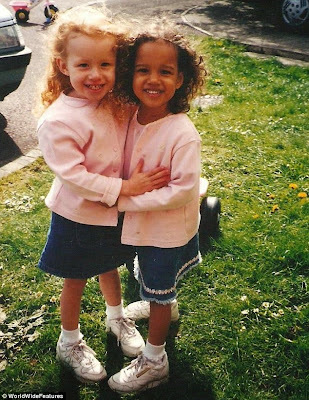 The 18-year-olds have three older siblings, George, 23, Chynna, 22, and Jordan, 21. Lucy said: ‘Our brothers and sisters have skin which is in between Maria and I. We are at opposite ends of the spectrum and they are all somewhere inbetween.